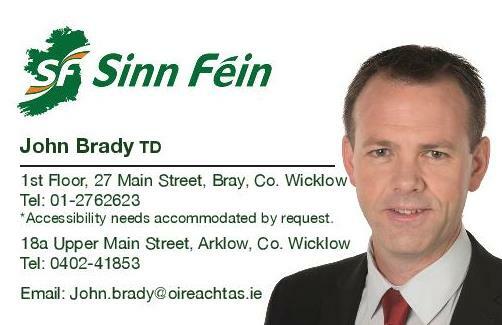 Sinn Féin TD for Wicklow/East Carlow John Brady TD has said development in Blessington has been stalled indefinitely due to limitations on wastewater treatment capacity. “Following ongoing engagement with Irish Water on the capacity of the Wastewater Treatment Plant and the serious consequences this is having on development in Blessington, I have received notification of their plans. This is a huge cause for concern as until this is addressed, development of any sort is hindered. “Irish Water acknowledged that they are aware of the development pressures in Blessington and recognises that it is an important growth centre, which is potentially constrained by limitations on wastewater treatment capacity. “Irish Water confirmed to me that they have initiated a study into options to upgrade the Blessington Wastewater Treatment Plant beyond what is currently available in order to facilitate the further expansion of the area. Currently, the plant has a capacity level of 6,000 PE (population equivalent) with the proposed works including an increase to 9,000 PE. “However, the issue here is the time frame that Irish Water has set themselves which, in reality will mean that we are looking at 2019 before any upgrade works take place, at the earliest. “Blessington cannot remain at a stand-still until Irish Water commences these necessary and well over-due works. “The local authority’s hands are tied; they cannot progress with building much needed social housing.